Soon enough I should come along some caveats causing me to change things a bit while still retaining most of the original concept. Please click on the thumbnail image to get a larger view of the concept drawing. Compared to the original concept I had some additions in mind. First of all you need to configure the redirection scheme on your transit router. I implemented it using access lists and a combined route map. Now these access lists are combined into a route map. The route-map first matches against the allowed MX hosts (preference 10 and 15) and then against all unspecified hosts (preference 20). The last rule causes unspecified connections to be redirected to the smtp proxy host by overriding it's next-hop. The SMTP proxy host requires that you create a special accept rule for the forwarded packets to be handled. A FreeBSD host requires ipfw with IP_FORWARD to be enabled in the kernel for this work. Consider that a "check-state ip from any to any" rule should not be invoked before any 'fwd' rules, otherwise the packets will be rejected as connection tracking is not supported on forwarded packets. All newer versions of Postfix support rate limiting through anvil(8). Anvil allows easiliy to keep track of connection and recipient numbers and reject clients if they exceed their limits. More complex configurations, eg. for different limits per source IP or subnet can be created using policy based routing in Postfix, though this is beyond the scope of this tutorial. Given the case a malicious client exceeds the rate limits set in the previous step, Postfix's anvil will automatically reject the client until the timeout interval is reached (1800s in the example above). While this should stop immediate abuse, an attacker could try to adjust his delivery limits to stay below our treshold. This can be avoided if a client's IP address was to be blacklisted temporarily upon exceeding the limits. For interopability reasons I have written the 'dsb' plugin for my logtail daemon (both to be released shortly), which basically monitors the maillog and adds any client IP exceeding the rate limits to an internal DNS blacklist. I choose not to use classic MTA-specific hash tables as DNS is more portable and can easily be used in a distributed environment. Additionally you'll need to setup a blacklist zone (myrbl.mydomain.tld in the exmaple) on your favorite DNS server (ISC BIND strongly recommended, server must support dynamic zone updates for full compatibility with logtail + dsb). 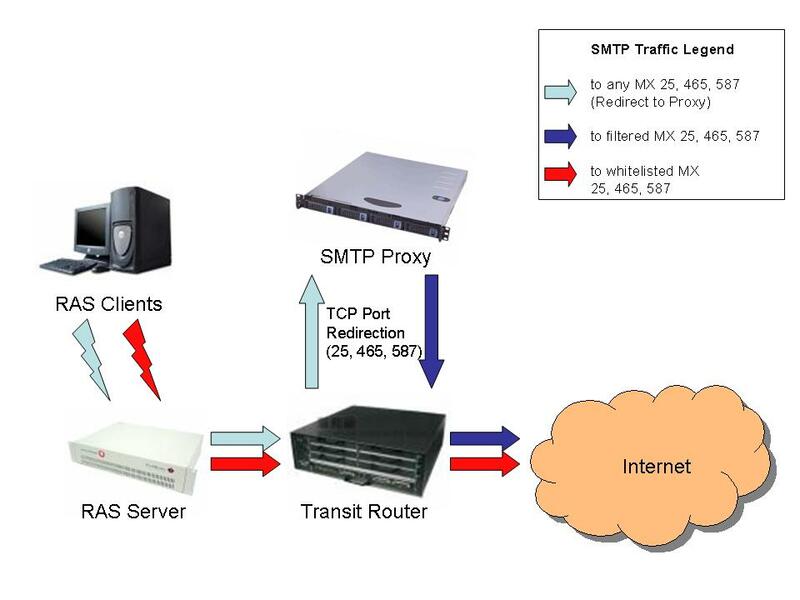 Then install logtail + dsb plugin on your SMTP proxy server and enable it for automatic startup. For logtail + dsb visit http://phaq.phunsites.net/dsb (software to be released soon). If you chose to use logtail + dsb for automatic IP blacklisting support, this addition may come in handy. The logtail + dsb package includes a handy little tool which is to be added to your Radius server to allow for automatic unlisting an IP address upon client disconnect. This will workaround an IP from your dynamic pool staying blocked even if the malicous client disconnected ages ago.